Decorating for the Fall Holiday Season - Table Settings, Fireplaces and More! Now that summer's over it's time to get excited about fall and all the festivities that this season brings! I love the holidays and I enjoy expressing this love around my home. This year I decided to continue with my overall blue theme and add my fall decor. I wasn't so sure about it at first but with the help of my dear grandmother, I think it turned out lovely! I absolutely loooove the way these colors look on my kitchen table. I think that you can make a statement with any color and it doesn't always have to be the standard colors of autumn. Pumpkins and leaf garland from Joann's Fabrics sets the fall scene in my dining room. As Thanksgiving approaches I may add a few things but this decor has me wanting apple cider or pumpkin pie! 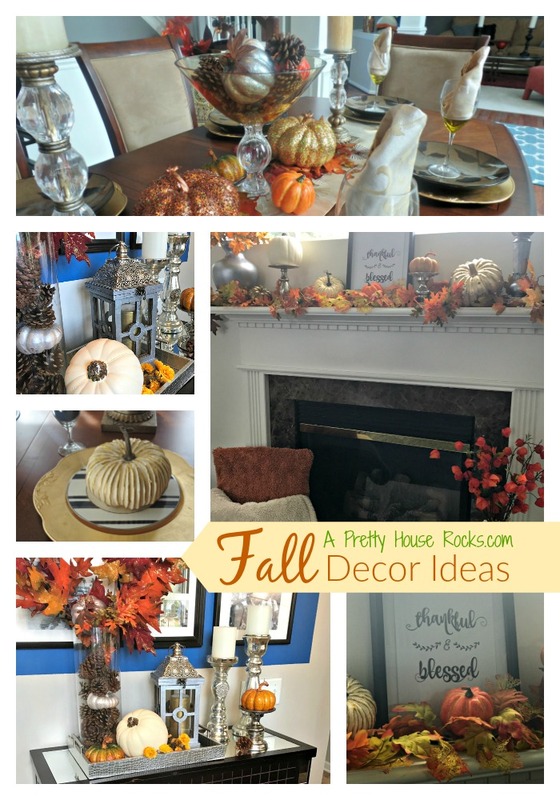 I used my table runner in the sun room but these fall inspired table mats work perfectly as a faux runner! I simply added a few fall silk flowers from Michaels and Joann's and changed my candles to add a touch of fall decor to my fireplace in the family room. I hope these designs have inspired you! Thanks for visiting A Pretty House Rocks!!!! !